Low casseroles from WMF: fry and stew all in one pot! Make life easy for yourself. The WMF low casseroles bring together the best from frying pans and high casseroles and can handle just about anything – frying, adding sauce, stewing. You'll wonder how you ever lived without it! Whether you're cooking pot roasts, goulash or beef rouladen, a good stew must be browned at high temperatures and then needs a lot of time. So that you don't have to fiddle around with pots and pans at the same time while frying and stewing, just reach for one of our professional-quality WMF low casseroles – with its special structure it combines all you need to prepare a stew in just one pot. Low casserole have higher edges than traditional frying pans so that you don't get as many fat splashes when frying. At the same time this has the advantage that you can stew with a little liquid, which is not always possible in a frying pan. The edges are still lower than those of normal high casseroles. This means that liquid evaporates more quickly. Creating an appetising brown colour and the right roasted flavour rounds off your culinary creation. The low edges also make it easier to turn the meat over. WMF low casseroles are available in various sizes, meaning that there is something for everyone, from the single-person household to the biggest of families. In our online shop, you can find our low casseroles in six different diameters between 12 and 28 cm, and you can rest assured that the matching glass or stainless steel lid will come delivered in a matching size! The volume of our pots varies between 0.7 l and 4.8 l. Whether you're cooking up a little portion of vegetable stew or a massive roast beef, a WMF low casserole guarantees fun while cooking and an ideal stewing experience. Whether you prefer the Quality One collection in its classically-inspired elegant style or the practical Function 4 version, you can find low casseroles in a range of sizes to match a variety of WMF cookware collections. Most models are made of Cromargan® stainless steel 18/10, and in most cases are also suitable for induction cookers thanks to the patented TransTherm® universal base.  WMF models in cast aluminium also form part of the assortment. A perfect stew means tender meat, an aromatic sauce and a minimum of mess in the kitchen – just some of the advantages of WMF low casseroles!